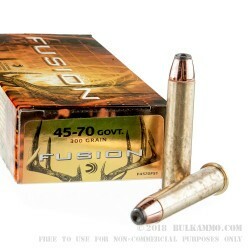 What you can do with the .45-70 Government is essentially only limited by your imagination. You can easily hunt animals as small as deer with this massive cartridge, and yet it is easily serviceable against dangerous game like bear. 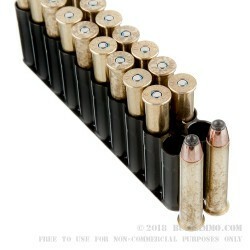 The loadings offer a huge spread in the grain weights; powder weights and projectile types. 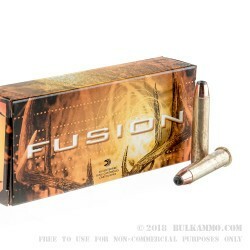 In this case of the Federal Fusion, while it is a somewhat expensive round to shoot, it is among the best for the grain weight of all the .45-70 cartridges. The 300 grain weight bullet is suitable mostly for densely forested big game work where your target is Elk and larger, but because of the relatively slower moving bullet and the large diameter it can be used for deer, or pushed up a bit in clearer areas. 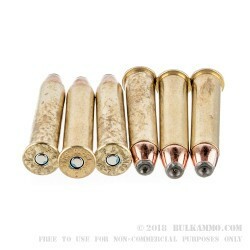 The copper jacket is electrochemically plated onto the lead core which offers significant weight retention on impact, and the skived bullet is actually more like a hollow point on this particular loadout, which offers exceptional terminal ballistics on the hardest to kill, toughest skinned game.